So it seems Black Friday has come a week early to some. 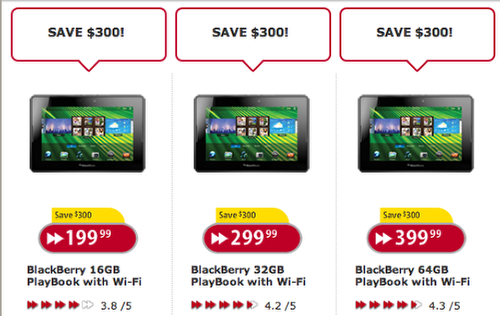 Futureshop and Best Buy Canada have dropped their prices for the BlackBerry PlayBook. Whichever version you’re interested in you’ll save $300, allowing for the cheapest 16GB version to be had for only $199.99. The 32GB will cost you $299.99 and the 64GB version $399.99. The only problem you might have is trying to find stock. We checked the online stores at both Best Buy and Future Shop and both were displaying ‘temporarily unavailable’ messages for the 16GB versions but the 32GB and 64GB are currently in stock at Best Buy, click below to purchase..
Click here to keep updated on stock at Future Shop.